Nothing says loving like a few more hotel rooms. Investors and developers are betting heavily on the hotel business in and around Seattle — a robust indication of the faith they have in the region’s future. Rising room rates and strong bookings have brought a series of record-setting hotel sales recently, while dozens of new hotels are being proposed for Seattle and neighboring communities. In fact, the Puget Sound region has the third most aggressive pipeline for new hotel projects in the nation behind New York City and Miami, says Mark Fraioli, a senior vice president with the Hotels & Hospitality Group in the San Francisco office of real estate services firm Jones Lange LaSalle. The hotel industry is a cyclical business highly dependent on the ebb and flow of business and leisure travelers and their own willingness to spend money. It can be a risky place to invest, but the growing popularity of Seattle among foreign travelers as well as the strong demand from conventions make it a relatively safe bet. Making Accommodations. R.C. 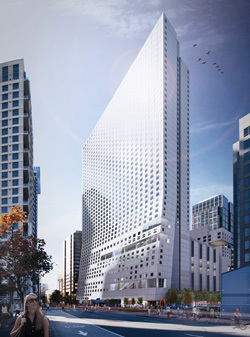 Hedreen’s proposed building on the site of Seattle’s former Greyhound bus station would add at least 1,200 hotel rooms. Investor interest in Seattle began to ramp up in 2012 as prospective buyers found prices too rich in top markets such as Los Angeles and San Francisco. Two recent hotel purchases have reached “an entirely new level” that shows “the Seattle market has achieved a level of national acceptance with investors that it has not had in prior cycles,” Fraioli notes. Meanwhile, national hotel chains and independent operators are eager to build hotels here. Proposed developments will add about 6,900 rooms to the Puget Sound region’s supply of roughly 42,000 rooms, an increase of 16.4 percent, compared to an average of 10.2 percent for the nation’s top 25 markets as a group, according to Jones Lang La Salle. Smith Travel Research, which tracks the hotel industry, is monitoring 35 hotel projects in the Seattle area. Many are in downtown Seattle and the adjacent South Lake Union neighborhood, where fast-growing Amazon.com has its headquarters. If all the hotel projects get built, the result would be a 30 percent increase in lodging accommodations in downtown Seattle and South Lake Union. • 1900 First Avenue Hotel & Apartments at First Avenue and Stewart Street, featuring 130 residences and extended-stay suites and 119 hotel rooms. • Hill7, at Boren Avenue and Stewart, featuring offices and a 14-story Hilton Garden Inn. • Daola Tower, at Stewart and Minor Avenue, featuring a 78-room boutique hotel and 95 condominiums. • 1200 Stewart, at Stewart, Minor and Denny Way, featuring a 252-room hotel and 340 condominiums. Some are concerned that the glut of hotel projects will result in overbuilding, which will drive occupancy and room rates down again. Others say the projects are paced so that event is unlikely, barring another severe economic downturn. Investment in existing hotels is also ramping up. In June, the Thayer Lodging Group, a subsidiary of Toronto’s Brookfield Asset Management, and Portland-based Provenance Hotels agreed to pay $62 million, or $517,000 per room, for Hotel 1000 in downtown Seattle. That broke the local record price of $410,000 per room set just weeks earlier when Connecticut-based Cornerstone Real Estate Advisers paid Lowe Enterprises of Los Angeles $130.7 million for the former Red Lion Hotel on Fifth Avenue, which has been renamed the Motif Seattle (see accompanying story on page 46). These deals follow another record-setting acquisition last fall. In that one, Palm Beach-based Chatham Lodging Trust paid a real estate investment fund of Denver’s Miller Global Properties $71.8 million for the 231-room Residence Inn by Marriott in Bellevue. That works out to just under $311,000 per room. Prior to those sales, the Seattle area had been a quiet market. Seattle’s transaction volume was 40 percent that of Los Angeles — even after adjusting for differences in population — and one-fifth that of San Francisco and San Diego, according to Fraioli at Jones Lang LaSalle. These recent prices reflect the confidence investors have in Seattle. The Puget Sound area economy continues to outpace the nation, thanks to strong performances by Boeing, Microsoft, Starbucks, Amazon and other local firms. Last year, the U.S. Census Bureau reported Seattle was the fastest-growing large city in the country. Private equity firms, real estate investment trusts and offshore buyers account for almost 65 percent of sales nationwide, according to Jones Lang LaSalle. Locally, a group of Asian investors led by Shanghai resident Yang Chun of Yareton Investment Funds are backing the $45 million Artemis Hotel project in Des Moines. Investors are using the federal EB-5 program that grants green cards to foreign investors who put at least $500,000 into projects that create jobs in certain areas. Current hotel occupancy in Seattle is just under 80 percent — “incredibly strong” for a city that’s a bit seasonal, says Tom Norwalk, CEO of Visit Seattle, a nonprofit marketing organization. In effect, Seattle hotels are full Monday through Thursday, notes Chris Burdett, a senior vice president with CBRE Hotels in Seattle. 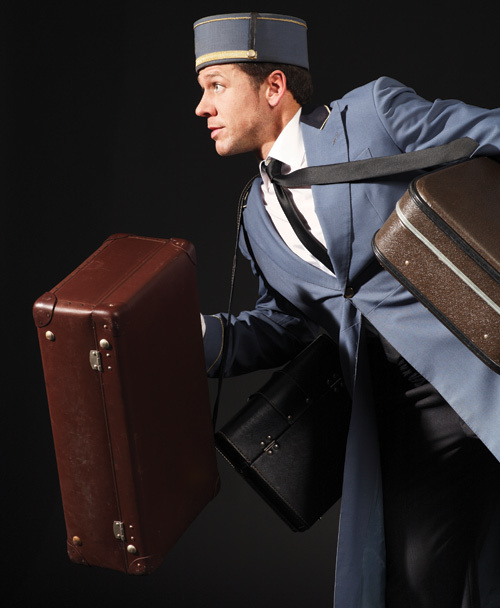 The demand is coming from both business and leisure travelers. Total visitor spending in Seattle and King County was $6 billion last year, up 6.9 percent from 2012. Leisure travelers account for 87 percent of that total, according to Visit Seattle. This year, 178 cruise ships will dock here, bringing about 900,000 passengers to the city during the season. Many will spend a few days in town before or after their cruises, staying in local hotels and sightseeing. They spend handsomely during their stays. Each ship brings on average $2.2 million into the local economy, says Port of Seattle media officer Peter McGraw. Meanwhile, Seattle has become an increasingly popular destination for foreign visitors. Overseas travel from China increased 90 percent over the past three years, Norwalk points out. Delta Airlines’ decision to add dozens of domestic and international flights into and out of Seattle-Tacoma International Airport will give the city an additional boost in coming years. “Nothing is more important to stimulating business and leisure travel than new city-to-city air routes,” Norwalk notes. Strong bookings also enable hoteliers to raise the price of hotel stays. Room rates are expected to rise by 3 percent to 4 percent or more in or near Seattle this year, according to a second-quarter report from the real estate services firm Kidder Mathews. Hoteliers are also mulling Seattle’s decision to phase in a $15-an-hour minimum wage for major employers during the next several years. One worry is its impact on real estate valuations, which are based on profits. With labor being one of the biggest costs in the hotel business, the new minimum wage could affect how appraisers and banks look at future hotel developments, Burdett says. Burdett expects the higher minimum wage will have the greatest impact on the food and beverage businesses. Opponents of the minimum-wage hike say hotel operators are likely to outsource services to vendors in municipalities not affected by the minimum wage. Others say it will lead to higher room rates that will drive bookings to other markets. Added hotel space would benefit an expanded convention center. A proposed expansion of the Washington State Convention Center (WSCC) would help drive up demand for new hotel rooms slated for downtown Seattle. The city has the smallest convention facilities of its competitive set, which includes Salt Lake City, Portland, Phoenix, Denver and San Diego, according to Jeff Blosser, president and CEO of the WSCC. Expansion would put Seattle “in the middle of the pack,” Blosser notes. The $750 million project would add 60 percent more meeting, exhibition and ballroom space to the convention center and make Seattle more competitive for all but the biggest national conventions. This year, the convention center turned away 60 meetings because dates were not available. Officials estimate the impact of the lost business at $306 million. Expansion will allow the city, which currently brings in about 40 national conventions a year, to attract bigger meetings and to retain events that are beginning to outgrow the present facility. The convention center does well with meetings of 3,000 to 5,000 attendees. An expanded facility could handle two such meetings at once, Blosser explains. That would help keep demand for hotel rooms steady because hotel occupancy dips as one convention shuts down and another sets up. The organization is negotiating with King County Metro Transit, which owns the 2.4-acre transit tunnel site next to where the expansion would take place. Challenges include agreeing on the value of the land, making sure both the transit system and the convention center can operate there and that freight trucks can reach the site to set up trade shows, Blosser says. He hopes to have at least a deal in principle by the end of the year. WSCC would issue bonds backed by hotel taxes to pay for the expansion.